Satisfy your evolving needs with the flexibility of a fully modular mono printer. Loaded with innovative features, Lexmark’s T642 delivers lightning-fast print speeds reaching 43 ppm! The T642 is reliable, very robust and requires minimal intervention. Want to spread the advantages to multiple users on your network? The network models come with MarkVision Professional, which provides hassle-free configuration and a wide range of remote management tools to minimise downtime. Fully modular, the T642 offers incredibly high maximum input and output capacities, plus a broad array of options, spanning advanced finishing, duplex printing, expandable memory and much more. Get it how you want it. Now you can ensure your confidential documents always stay in the right hands. 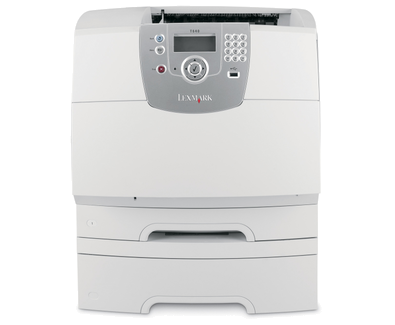 The T642 is armed with innovative security features for confidential printing, such as ‘print and hold’, automatic job expiration, and lockout modes for invalid PIN entry.